If you’re a chocolate and peanut butter lover, these brownies are for you! 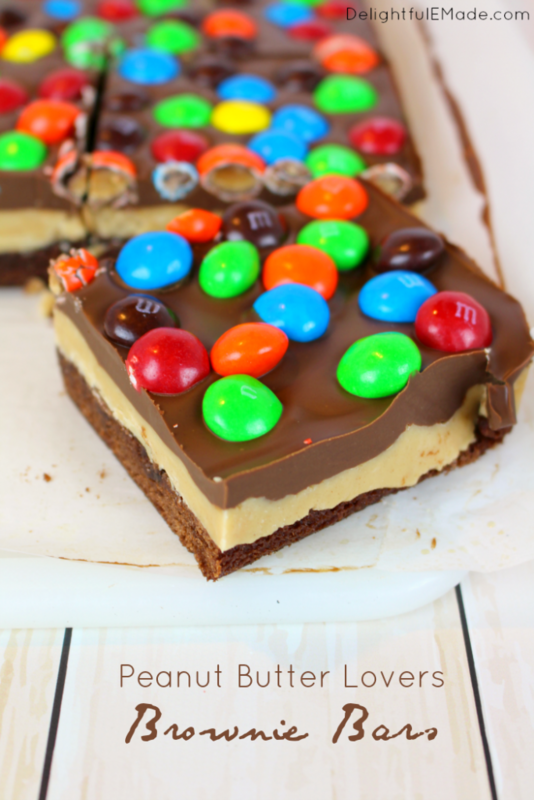 Rich, fudgy brownies are layered with peanut butter filling, a chocolate peanut butter ganache and topped with lots of M&M’s® Peanut Butter candies! The perfect treat for family game night, or anytime you’re in the mood for a chocolate and peanut butter treat! Do you and your family have a hectic schedule? 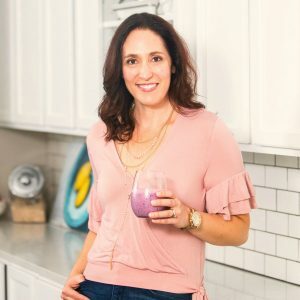 Are you juggling work, kids school schedules, sports practices and games, dance practice, recitals, and music lessons on a pretty regular basis? I certainly know the feeling! My son has practices and events for his Drum Corp, after-school robotics class, Tae Kwon Do and soon Baseball season is going to start. Once we get home, get dinner taken care of, and homework finished, it’s time to get everyone to bed. Weeknights tend to be a blur, and finding time to reconnect as a family gets harder and harder. Luckily, we do have one night a week (right now that’s Friday night) where nothing is scheduled. We’ve instituted a weekly family game night – a night where we get to sit down with each other, talk, laugh, and enjoy a great treat! While making my regular trip to Walmart, I cruised through the Toy section to pick up a new game to add to our Family Game Night rotation. The Game of Life was a fantastic choice for everyone in our family. 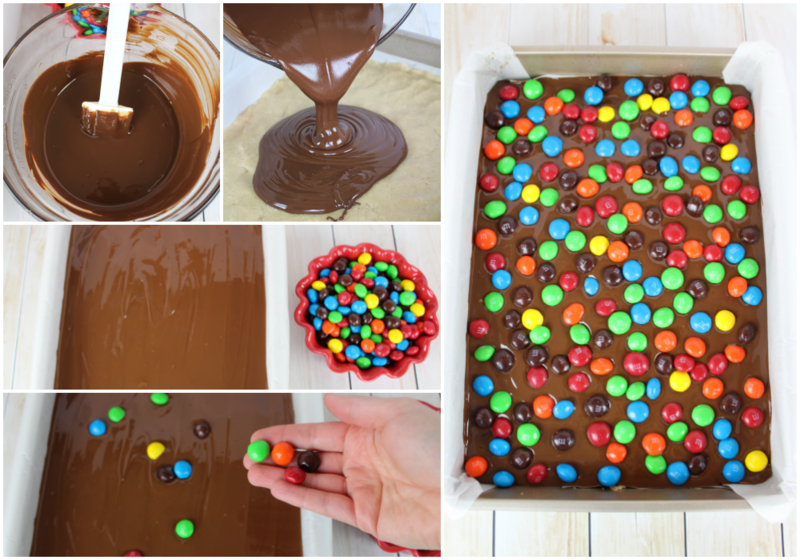 I also picked up a couple of XL bags of M&M’s® Peanut Butter and M&M’s®Peanut , perfect for snacking and making a batch of my Peanut Butter Lovers Brownie Bars! 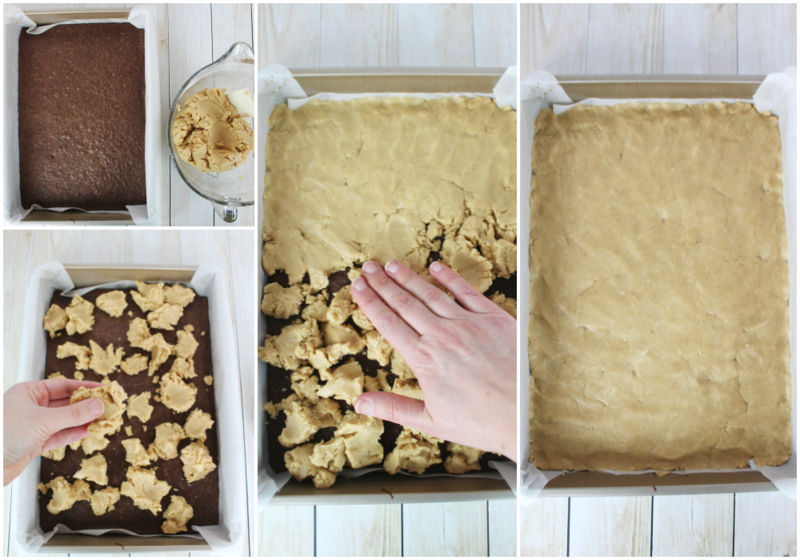 Making a batch of these super-delicious Peanut Butter Lovers Brownie Bars are pretty simple. You’ll start with a basic brownie mix baked in a 9 x 13″ pan lined with parchment paper. (Lining the pan with parchment paper is helpful, as it makes lifting the bars out of the pan, and cutting much easier.) 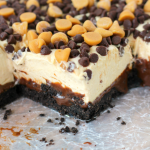 While the brownies are still warm, you’ll top with a delicious peanut butter filling. This comes together easily, and can be pressed right on top of the brownies with your hands. From here, you’ll then make the chocolate peanut butter ganache (which is just a fancy way of saying “melted chocolate and peanut butter.”) Chocolate chips and creamy peanut butter are melted together in the microwave. 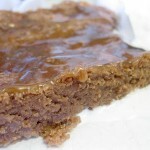 When completely melted and smooth, you’ll then pour this over the top of the peanut butter filling. 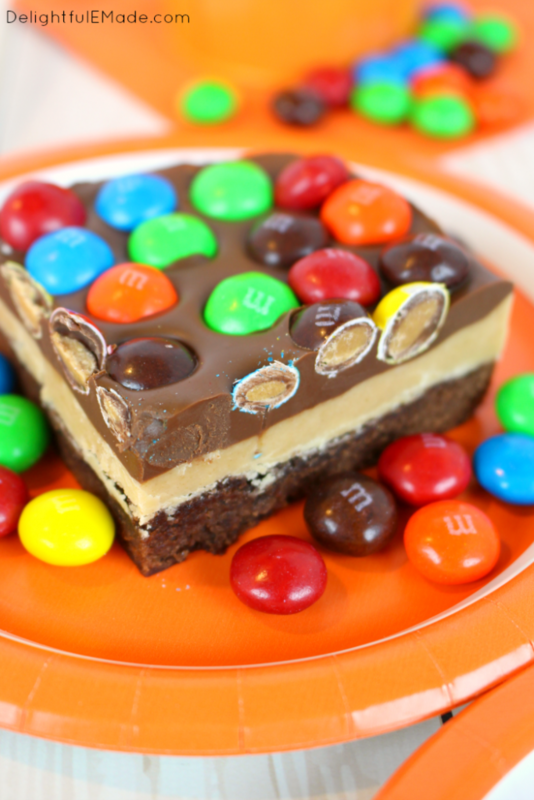 Top with lots of yummy M&M’s® Peanut Butter candies, for a colorful, delicious crunch that rounds out these brownies perfectly! Make these brownies ahead of time, as the chocolate will need to set and refrigerate before cutting. 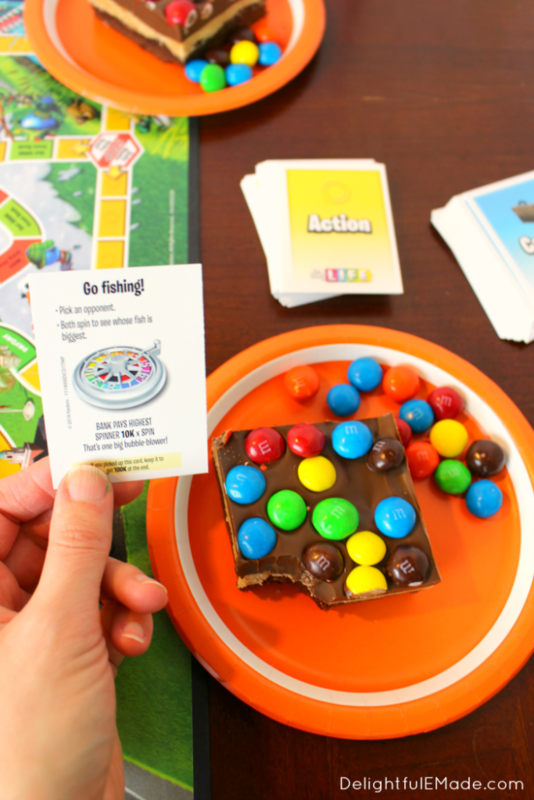 Once you’re ready for family game night, you’ll have the most delicious treat to enjoy with everyone at the game board! 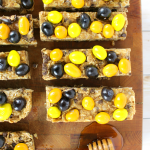 Slice up these bars, and have extra M&M’s® Peanut Butter and M&M’s® Peanut candies for snacking. 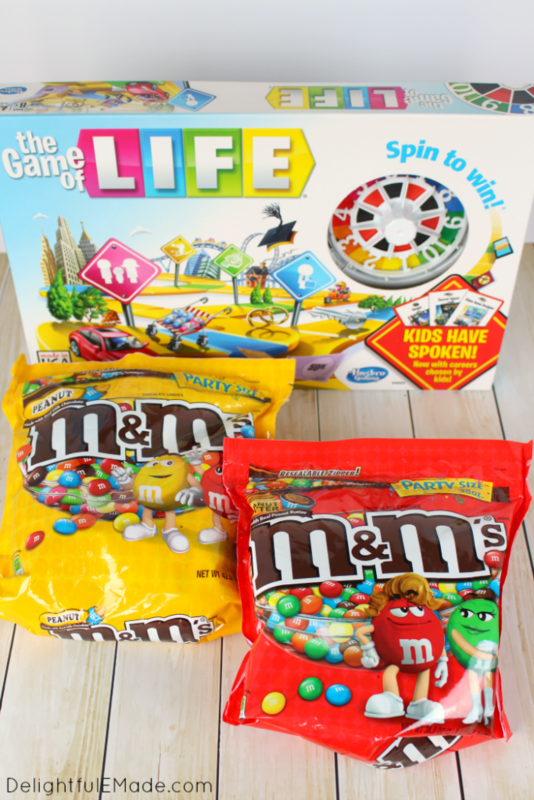 They’re the perfect sweet treat to go along with the adventures of The Game of Life! As I’m sure you can image, our game nights are always rather “spirited” and lively! My ‘lil guy ended up winning the entire game with loads of money leftover, and my husband and I were nearly broke. Funny how that happens! 🙂 While playing our game, we were able to laugh, talk about our week and reconnect with each other. Setting aside this time on Friday night is really well worth it! If you're a chocolate and peanut butter lover, these brownies are for you! 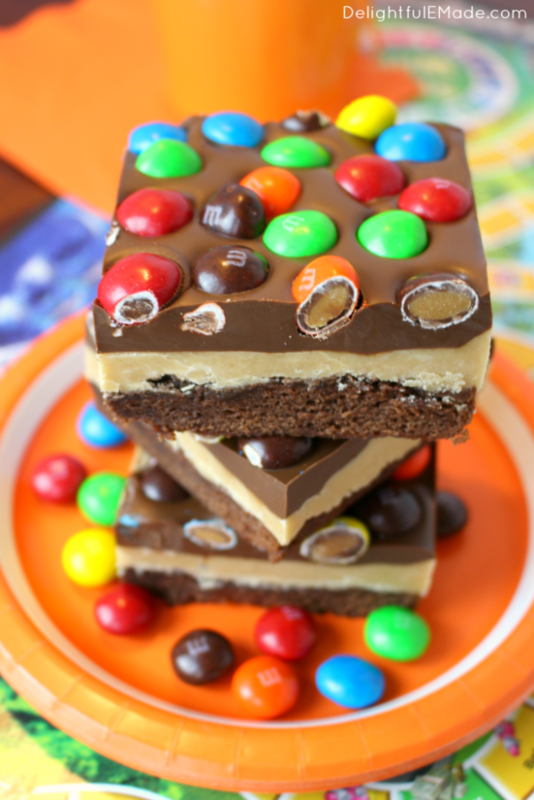 Rich, fudgy brownies are layered with peanut butter filling, a chocolate peanut butter ganache and topped with M&M's® Peanut Butter candies! 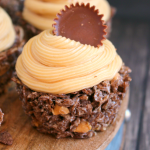 The perfect treat for family game night, or anytime you're in the mood for a chocolate and peanut butter treat! Preheat oven to 350 degrees. Line a 9 x 13" pan with parchment paper, and lightly spray with non-stick baking spray. Set aside. In a mixing bowl, combine the brownie mix, water, oil and eggs. Mix until smooth and lump-free. Spread into prepared pan, and bake at 350 for 24-26 minutes. While brownies are baking, mix the peanut butter filling by combining the melted butter and peanut butter. Stir until completely combined. Stir in the vanilla. Gradually mix in the powdered sugar one cup at a time. Mixture will be thick and dough-like. Once brownies come out of the oven, let cool for about 10 minutes. While brownies are still warm, top the brownies with the peanut butter filling, and press with hands to cover completely. For the chocolate peanut butter ganache add the chocolate chips and peanut butter into a microwave safe bowl. Heat for 1 minute on high power. Stir. Heat for another 20-30 seconds, or until all chocolate chips have melted. Pour the ganache over the peanut butter layer. 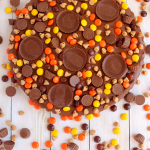 Sprinkle the M&M's® Peanut Butter Candies evenly on top of the ganache. Refrigerate for at least 2 hours or overnight before cutting. 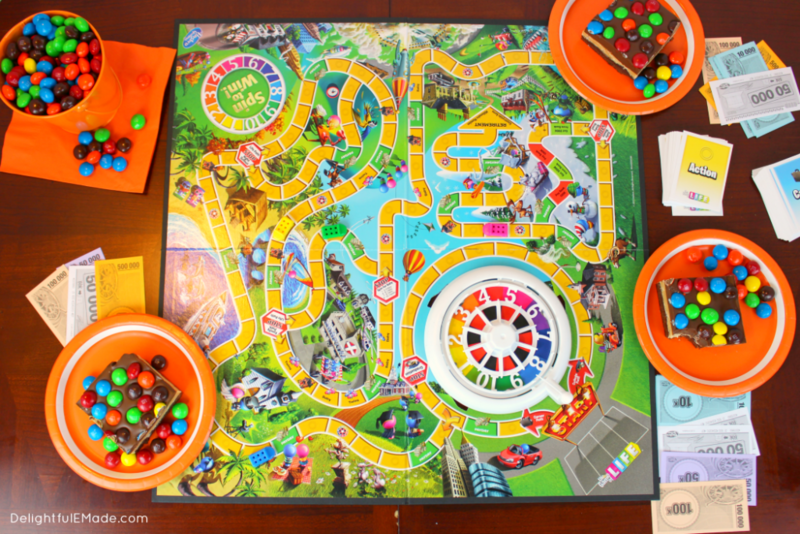 Would you love to see more fun game night ideas? 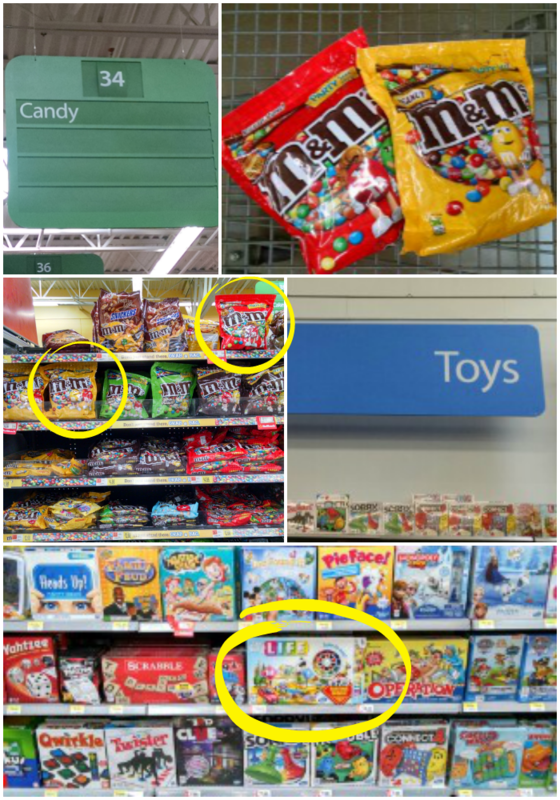 You can find many more game night ideas along with delicious recipes and treats with M&M’s® Candies here. These look so delicious! What a treat! These wouldn't stand a chance around me ;) Yum! Stop, these look like my dream come true!!! Such a great idea! We love family game night with out grandchildren and I can't wait to add this recipe to the mix. These are so fun and I know the whole family would love 'em! perfect sweet treat for family game night. A color fun too! Wow!...I'm a peanut butter lovers! 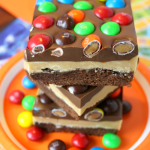 And these brownies looks amazing! These look AH-MAZING! Love these flavors together fo sure!! Plus I love Life! We are having game night this weekend and I so need to pick that up! Thank you for sharing with us at Throwback Thursday, we hope to see you again next week! Wow, these look amazing! Definitely pinning for later. I'm on a diet right now and this is killing me. I want to eat every single bit! Will definitely have to make this someday. Oh MY Goodness! I want to come play Life at your house. Those look so yummy! I am pinning these and putting the ingredients on my shopping list right now. These look absolutely amazing. I just so happen to be a peanut butter lover! Thanks for sharing at Throwback Thursday! Would this work ok with natural creamy pb? Do you keep the brownie bars refrigerated or is it just for the initial hardening?